Amps or amplifiers are one of the four main components to a church audio system or any live sound production. The purpose of amplifiers is to take the weak, powerless signals, generated from the soundboard, process them and then add electrical signals to power the speakers. Proper care will ensure the best working amps; with minimal signal loss and quality signals sent to the mains. Where Should Amplifiers Be Placed? The amplifier is generally the final step before the signal gets converted to into sound. 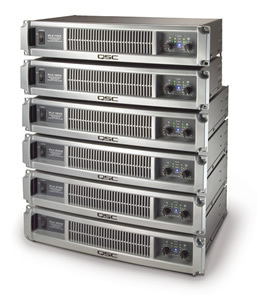 It is important that these amplifiers be placed in a dry, cool environment. The amplifiers should never be touched, unplugged or altered in any way if you are unqualified, or untrained to do so. For security, and safety, I recommend securing your amps in some sort of rack mount solution where the cables are organized well, and out of the way. Most churches have their system set up and calibrated with the appropriate amp levels, so generally you shouldn’t have to change anything on them once your system is installed. Air flow is important as well, as some churches situate their amps in a closet, with poor or no ventilation. This is bad for a few reasons. Firstly, it is a fire hazard if a stack of amps are operating on top of one another without any air flow. Secondly, the initial processing of the amps are normally equipped with over heating sensors that when over heated, will shut down. Be careful of this because older amplifiers may not have this function. Make sure after all the services or when the amps aren’t in use, that you turn them off. How Should They Be Hooked Up? Like everything else in audio, it is important that you don’t lose signal quality. Generally speaking you want to keep your amps as close to the speakers as you can. A common problem with audio occurs when the power amplifiers are too far away from the speakers, venues will lose a lot of sound quality with longer cables. The shorter your cables, the better your sound will be. There are two types of cables that are commonly used to transfer the powered signal from your amp to your speakers; speakon cables, and quarter inch cables. Either cable will work fine, but you want to make sure that the cable is shielded and that it is rated for the same wattage/voltage as the amount of power you are sending through it. Do not under any circumstance use unshielded instruments to connect your power amp to your speakers, you will damage your amp, the cable, and the speaker. Make sure that you carefully examine the power rating of your amplifier and your speakers. If you amp is either over or underpowered it will result in damage to the amp, and to the speaker. Make sure that you consult an audio specialist when making your final purchase. Audio amplifiers can have a wide range of prices; usually starting from around $350-$900 and upwards. It is important that you have great quality amplifiers for your church; you do not want unreliable amps powering expensive speakers. Amplifiers are defiantly important because of their responsibility in the reproduction of your audio signals. Make sure that your amplifiers are properly taken care of and placed in an appropriate location. This will ensure the quality of sound and the life of your amps with regards to your whole PA system.